The largest global sports media property in Asian history, ONE Championship™ (ONE), has once again electrified the capacity crowd at the Impact Arena in Bangkok, Thailand with another exciting evening of world-class martial arts action. ONE: CLASH OF LEGENDS delivered a series of compelling bouts, performed by the absolute best in local and international martial arts talent. In the main event, Nong-O Gaiyanghadao of Thailand defeated China’s Han Zi Hao to capture the inaugural ONE Bantamweight Muay Thai World Championship. In the main event of the evening, Muay Thai legend Nong-O Gaiyanghadao of Thailand overwhelmed China’s Han Zi Hao to earn a unanimous decision victory and capture the inaugural ONE Bantamweight Muay Thai World Championship. Nong-O put on a striking clinic for five rounds as he unleashed a wave of kicks and punches that knocked Han down on multiple occasions. After five action-packed rounds, it was Nong-O who was hailed as the new World Champion, as he added another prestigious award to his already impressive list of accolades. In the co-main event of ONE: CLASH OF LEGENDS, Muay Thai icon “Left Savage” Kongsak P.K.Saenchaimuaythaigym turned in a successful ONE Super Series debut, defeating Russian Alaverdi “Babyface Killer” Ramazanov via split decision. In an exciting three-round affair, the two world-class strikers stood toe-to-toe and went back-and-forth as they traded blistering combinations. In the end, Kongsak did enough to earn the decision on two of the three judges’ scorecards to come out triumphant in his maiden ONE Championship appearance. Japanese grappler Shuya “Stealth” Kamikubo continued his stellar run in ONE Championship as he dominated former ONE World Title challenger Dae Hwan Kim of South Korea to win by unanimous decision. Kamikubo showcased his elite-level grappling as he took Kim down at will and punished him on the mat with ground-and-pound. There were no doubts at the end of the three-round contest as Kamikubo walked away with the convincing decision victory. ONE Warrior Series winner Mark “Tyson” Fairtex Abelardo announced his arrival on ONE Championship’s main roster with a third-round stoppage of Japan’s Daichi Takenaka. Abelardo weathered through numerous takedowns and remained relentless as he continued to score points with his strikes whilst fending off submission attempts. In the final round, Abelardo delivered an elbow that opened up a deep cut on Takenaka, which caused a halt to the bout. The technical knockout victory was then awarded to Abelardo. Mongolian phenom Amarsanaa “Spear” Tsogookhuu left the Bangkok crowd stunned as he defeated hometown hero Shannon “OneShin” Wiratchai. Tsogookhuu flaunted his well-rounded skill set in his first ONE Championship appearance, dictating the pace in striking while also scoring a couple of crucial takedowns to assert his dominance. In the end, Tsogookhuu cruised to a unanimous decision victory. 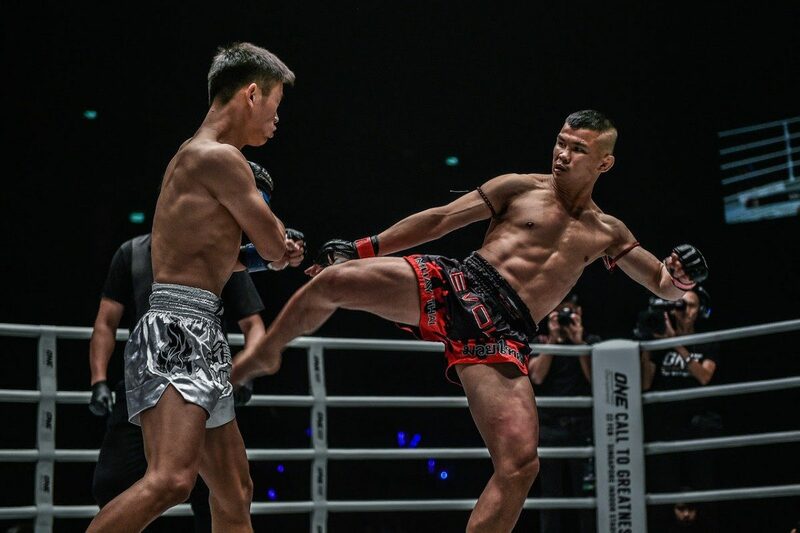 “Smokin’” Jo Nattawut of Thailand kept his momentum going in the highly-acclaimed ONE Super Series after defeating France’s Samy “AK47” Sana via unanimous decision. Sana’s height and reach proved to be a problem for Nattawut early in the match, but the two-division Lion Fight World Champion rallied back in the final two rounds with a torrent of thunderous low kicks. After three rounds of gruelling action, it was Nattawut who was declared the winner. Gina “Conviction” Iniong of the Philippines put on an all-around performance, shutting down Malaysia’s Jihin “Shadow Cat” Radzuan en route to a split decision victory. The Team Lakay stalwart was a step ahead on all fronts as she easily prevented Radzuan’s takedowns, while also picking the Malaysian standout apart in the striking department with her signature right hand. In a last-ditch effort, Radzuan caught Iniong in a rear-naked choke late in the third round, but the Filipina managed to hang on to the final bell. In the end, two of three judges saw the bout in favor of Iniong. In a battle between ONE Super Series debutants, Superlek Kiatmoo9 of Thailand emerged victorious, putting on a striking masterclass to defeat Cambodia’s Lao Chetra via unanimous decision. The two-time Lumpinee Muay Thai World Champion overwhelmed Lao Chetra with his world-class striking skills, unloading a barrage of lashing kicks to the legs and body. With a dominant performance against Lao Chetra, Superlek was declared the winner. In a ONE Super Series Muay Thai contest, Chamuaktong Fightermuaythai of Thailand edged out Charlie “Boy” Peters of the United Kingdom by majority decision to pick up his second win on the ONE Super Series stage. Both men employed fiery offense over the course of three rounds, with Peters utilizing his speed and accuracy to connect on a handful of crisp strikes. Chamuaktong turned the tide in the third round however, driving hard knees to the midsection to drop Peters to the canvas. The knockdown tipped the balance in favor of Chamuaktong, as two of the three judges saw him as the victor on their scorecards. Japan’s Yoshiki Nakahara routed Emilio Urrutia of the United States by way of third-round technical knockout in his ONE Championship debut. The Japanese warrior put forth a dominant striking performance, stringing together dynamic combinations in an offensive clinic against his American counterpart. Nakahara overwhelmed Urrutia with throbbing strikes from the opening bell, blasting his opponent with thunderous high kicks and cracking left crosses. In the third round, Nakahara finished the job, knocking Urrutia down with a perfectly-timed overhand left before unloading follow-up shots to get the stoppage. Kun Khmer World Champion Nou Srey Pov of Cambodia impressed in her mixed martial arts debut, toppling Thai heroine Rika “Tinydoll” Ishige via unanimous decision. The Cambodian newcomer showcased her pinpoint accurate striking early on, peppering Ishige with stinging kicks and stiff punches. Although Ishige boldly traded strikes with Nou Srey Pov from bell to bell, the latter landed the more telling blows. In the end, Nou Srey Pov earned the undivided nod from the three judges at ringside. Setting the tone for an action-packed evening was ONE Hefei Flyweight Tournament Champion Liu Peng Shuai’s triumphant return to ONE Championship. Liu showcased true grit and determination in defeating Elipitua Siregar of Indonesia, overcoming his opponent’s devastating offense to score an impressive submission victory by Kimura in the third round.